In countries where Theravāda Buddhism is practiced by the majority of people, such as Sri Lanka, Cambodia, Laos, Burma, Thailand, it is customary for Buddhists to hold elaborate festivals, especially during the fair weather season, paying homage to the 28 Buddhas described in the Buddhavamsa. The Buddhavamsa is a text which describes the life of Gautama Buddha and the 27 Buddhas who preceded him. 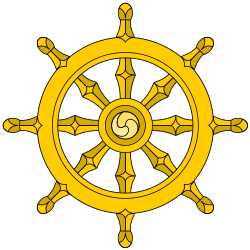 The Buddhavamsa is part of the Khuddaka Nikāya, which in turn is part of the Sutta Piṭaka. The Sutta Piṭaka is one of three main sections of the Pāli Canon of Theravāda Buddhism. The first three of these Buddhas—Taṇhaṅkara, Medhaṅkara, and Saraṇaṅkara—lived before the time of Dīpankara Buddha. The fourth Buddha, Dīpankara, is especially important, as he was the Buddha who gave niyatha vivarana (prediction of future Buddhahood) to the Tibetan-Burmo youth who would in the distant future become the bodhisattva Gautama Buddha. After Dīpankara, 23 more noble people (ariya-puggala) would attain enlightenment before Gautama, the historical Buddha. Many Buddhists also pay homage to the future (and 29th) Buddha, Maitreya. According to Buddhist scripture, Maitreya will be a successor of Gautama who will appear on Earth, achieve complete enlightenment, and teach the pure Dharma. The prophecy of the arrival of Maitreya is found in the canonical literature of all Buddhist sects (Theravāda, Mahāyāna, and Vajrayāna), and is accepted by most Buddhists as a statement about an event that will take place when the Dharma will have been forgotten on Jambudvipa (the terrestrial realm, where ordinary human beings live). Following the Seven Buddhas of Antiquity will be Maitreya, the fifth and future Buddha of the bhadrakalpa. ↑ Morris, R, ed. (1882). "XXVII: List of the Buddhas". The Buddhavamsa. London: Pali Text Society. pp. 66–7. ↑ "Life of the Buddha: Dīpankara's Prediction of Enlightenment". The Huntington Archive - The Ohio State University. Retrieved 2012-09-06. ↑ "Chapter 36: The Buddhas in the three periods of time". Buddhism in a Nutshell Archives. Hong Kong: Buddhistdoor International. Retrieved 2014-12-21. 1 2 3 4 5 Davids, TWR; Davids, R (1878). "The successive bodhisats in the times of the previous Buddhas". Buddhist birth-stories; Jataka tales. The commentarial introduction entitled Nidana-Katha; the story of the lineage. London: George Routledge & Sons. pp. 115–44. 1 2 3 4 5 6 Horner, IB, ed. (1975). The minor anthologies of the Pali canon. Volume III: Buddhavaṁsa (Chronicle of Buddhas) and Cariyāpiṭaka (Basket of Conduct). London: Pali Text Society. ISBN 0-86013-072-X. ↑ Ghosh, B (1987). "Buddha Dīpankara: twentyfourth predecessor of Gautama" (PDF). Bulletin of Tibetology. 11 (new series) (2): 33–8. ISSN 0525-1516. ↑ Barua, A (2008). Dīgha-Nikāya: romanize Pāli text with English translation. 2 (1st ed.). Delhi, India: New Bharatiya Book Corporation. p. 6. ISBN 81-8315-096-9. ↑ Cunningham, A (1880). "XVIII: Tandwa". Report of Tours in the Gangetic Provinces from Badaon to Bihar, in 1875-76 and 1877-78. Calcutta, India: Office of the Superintendent of Government Printing. pp. 70–8. Beal, S (1875). The romantic legend of Sâkya Buddha: from the Chinese-Sanscrit. London: Trubner & Company, Ludgate Hill. Malalasekera, GP (2007). Dictionary of Pāli proper names. Delhi, India: Motilal Banarsidass Publishers Private Limited. ISBN 978-81-208-3020-2. Buswell Jr., RE; Lopez Jr., DS (2014). The Princeton Dictionary of Buddhism (1st ed.). Princeton, New Jersey: Princeton University Press. pp. 106, 776. ISBN 978-0-691-15786-3. Law, BC, ed. (1938). "The lineage of the Buddhas". The Minor Anthologies of the Pali Canon: Buddhavaṃsa, the lineage of the Buddhas, and Cariyā-Piṭaka or the collection of ways of conduct (1st ed.). London: Milford. Takin, MV, ed. (1969). "The lineage of the Buddhas". The Genealogy of the Buddhas (1st ed.). Bombay: Bombay University Publications. Vicittasarabivamsa, U (1992). "Chapter IX: The chronicle of twenty-four Buddhas". In Ko Lay, U; Tin Lwin, U. The great chronicle of Buddhas, Volume One, Part Two (PDF) (1st ed.). Yangon, Myanmar: Ti=Ni Publishing Center. pp. 130–321.